Passing the hole is a problem that comes up when a club ends up on the ground during a passing pattern. It may be a pattern with two people or a group pattern, and the number of clubs you started with doesn't really matter (although we are only concerned with patterns with 3 clubs per juggler on this page). The idea is as follows. The missing club creates a hole in the pattern. The club in question is on the ground, and let's suppose it's close enough to one of the jugglers that he can pick it up. But he can't do it unless he only has 2 clubs in his hands. Therefore, the hole must be passed to this juggler. From your point of view (as opposed to that of your partner), you have two choices: either you keep the hole, or you pass it along when it comes (aka holding through the gap). To keep the hole, all you need to do is continue passing each time (keeping only 2 clubs and handing over the club each time to keep it going). To pass the hole, you must not pass until you have to (when you have 3 clubs and it's time to pass). your partner's going to pick up. In this case, it's imperative that you pass the hole. you're going to pick up. You can keep the hole until you pick up, but Charlie Dancey finds this method inelegant. The other solution is to have both jugglers pass the hole, and in this manner, you'll retrieve the hole eventually. Below you will find several methods to pass or keep the hole in 4-count or in 2-count. 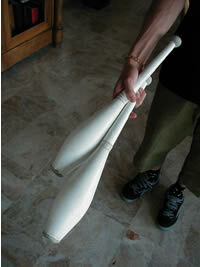 In 2-count, you may also continue to juggle when you have just 2 clubs, i.e. go on as if the hole was a club. The hole goes around a little slower but you earn points for style (Note: of course this is possible in 4-count, but it's easy to trip up, and the hole moves really slowly). If you want to keep the hole regardless of what Charlie thinks about it, just continue to pass in rhythm, even if you only have 2 clubs. You then hand the club across (or do selfs) so you can catch your partner's passes. The instructions above apply to the special case of 2 jugglers, but think a bit about the potentially useful concept of group passing (feed, line...) to get the hole to the person in the best position to pick up. Generally, if you get the hole but can't pick up the club on the ground, continue to juggle anyway, passing the hole. There's a good chance that it will get to the person who can pick it up. If you can pick up, wait until the hole comes back and make use of it. If you need a little time to think, you can send it (the hole) around another time, or keep it (recommended in certain cases--for example, if you are a feedee in a feed). This step is intended to teach you to throw a club and to receive one all while juggling. Using "just" 5 clubs allows you to separate the two movements which in a normal passing pattern happen one right after the other. Divide and conquer, as they say. Be sure to be well practiced in throwing and catching first. In the following exercises, try to throw with the whole arm and not just with the wrist. A bit of vocabulary before we begin: a self is a throw made to oneself, as opposed to passes. A self can refer to single or double throws, clubs that are handed across... but unless stated otherwise (and in particular, in all of the learning section) they are single-spin throws which go from one hand to the other. 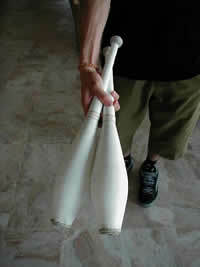 So take 5 clubs for 2 jugglers. 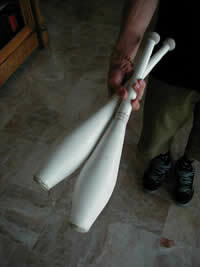 While A (one juggler) juggles 3 clubs, B (the other) waits with the other 2 (one in each hand) until A throws him a pass. B then tries (tries, since at first it doesn't always work) to start to juggle with the club coming in, to stabilize, then to send another pass to A and begin again. In your opinion, what should you do? Work both hands equally, of course. You must realize that it's undoubtedly a bit harder at first, but that will make up for itself in the long run. Ambidextrous passing patterns far outnumber unilateral ones, so you will have to learn them anyway one day. Why only use your right hand only to find yourself later faced with problems with your left hand throws and have to relearn everything? It is now, at the beginning, that you should learn good habits. Voilà, that's the thought of the day, in hopes that the new generation of passers will be equally at ease with both hands. Now it's up to you to make your choice--the two methods of learning are on the table. You will notice that in this passing pattern (yes, it's a passing pattern, maybe even your first passing pattern! ), A only makes left-handed throws and B only makes right-handed throws. So you need to switch roles to work both your hands. As soon as one of the two of you feels comfortable with this exercise, (the other should get there too, but it's not necessary for both to do this at the same time), that person may try to pass the club a certain (predefined) time after having caught it. This is a matter of deciding upon a fixed number of selfs that you will make between the moment you catch and the moment you throw back. With 6 clubs, the 2 jugglers must make their passes at the same time, and they have to make exactly the same number of selfs after catching a pass in order to throw the next pass at the same time (otherwise there will be 4 clubs on one side and 2 on the other). With classical ambidextrous rhythms, you can choose any even number (including 0) to decide how many selfs you're going to make between catching a pass and making one. I suggest trying 4 selfs to begin with (5-count) then try with 2 selfs (3-count) Here also you should change roles so that each may practice with both hands. All you have to do is count precisely 4 selfs after catching a pass; the throw following the 4th self will be your pass. To learn everything there is to know about causal diagrams, see causal diagrams and siteswaps in passing. You may find 3-count too fast at first, barely having enough time to stabilize your pattern before you have to pass again already. What you're going to do is, when a club is coming toward your left hand: LH self (so you can catch the club), RH self, LH pass. An easy way to know what you have to do is to take note that the club you'll be passing is the same as the one you just caught. In other words, if you take one red club and four white ones, you should be able to pass the red one back and forth while each juggler keeps the same two white clubs. The causal diagram is here so that you can look at it and compare it to 5-count. Also try the non-ambidextrous exercises below, which will also be useful for you, and then you can try them on the right side AND the left! Then you can try your first 6-clubs patterns. A starts juggling by making a LH self, which allows him to catch the club thrown by B since the left hand is now empty (figure 2). With classic non-ambidextrous rhythms, you can choose any odd number to decide how many selfs you're going to make between catching a pass and making one. I suggest trying 5 selfs to begin with (6-count), then try with 3 selfs (4-count). In 6-count, you throw back the club that you just caught as soon as it arrives in your right hand (if you caught it in your left hand). In 4-count, you pass the club that is in your right hand when the club that you caught gets there. It all comes down to throwing a pass instead of a 4th self (which is how we get 4-count, and it's similar for all n-count). This is the causal diagram of 4-count with 5 clubs (see above notes on 5-count for a quick explanation, or to learn more about causal diagrams, see causal diagrams and siteswaps in passing). When this becomes easy for you, you are ready for your first 6-clubs patterns. The main goal is to throw a club that will be easy for the juggler in front of you to catch. This is THE basic move when passing. So with only one club for 2, try to make passes until you have the trajectory down. The diagram below sums up the approximate trajectory of the club. The main problem is that you may use your wrist too much. The club then spins too quickly (doing almost 2 spins instead of 1) and is not long enough. It is normally much better to use the whole forearm and to gather momentum by making the club brush the leg before throwing it. If it is released by continuing this movement, it has enough energy to go up to your partner's hand and rotation is done naturally (no need of the wrist). When you are practicing with 3 clubs (juggling with 3, then throwing one), be sure that you are throwing your passes from the inside of the self ( I mean from the center of the pattern). This self can be thrown a bit more to the right (for a pass on the right side) in order to give you some space if you don't juggle very wide. Try also to continue to make the club move along your leg before throwing (depending on whether your juggling speed is fast or slow, the movement can be more or less wide). If the club has been thrown correctly, you catch it on the left of your shoulder (if you catch with the left hand) without needing to move. A pass spins in the reverse direction of the usual direction (when you juggle alone), and that explains the difference concerning the position of the hand on the pictures on your left. But naturally (and it is more obvious with a beginning partner) you won't receive nice passes every time, and you'll sometimes have to move sideways (to touch the club or sometimes just to save your head), to take a step forward or backward, or to jump. If the club is coming to you by the wrong end (the fat one), catch it anyway. You'll find different ways to manage that on the page "wrong end catches". You'll soon have to know how to do this trick because you'll always be faced with it. Right/left symmetry (feet and shoulders), especially for ambidextrous rhythms. Try to stand still, with shoulders parallel and elbows close to your body. Note: The explanations given here are for 6-club patterns, but can be adapted easily to 7-club patterns (e.g. : 4-count and some popcorns have 3 or more consecutive selfs in a cycle). Let's sum up the situation. You've just dropped a club (yes, we know, it's not your fault) and you now have only 2 clubs in your hands. Meanwhile, your partner keeps juggling, and is about to pass to you (it's quite important that he keeps passing). On this page, we deal with the pickup itself. I strongly advise that you have a look at the holding through the gap page, which explains how to keep passing while waiting for an opportunity to pick up. in 1-count (ultimate) or PPS ? There is more than enough time to pick up when you have the gap, during the 3 beats (4-count) or 2 beats (3-count) between each pass. You just have to kneel down, pick up and throw back a club at the same time as your partner's pass. or if the club is very much on the left, just place the 2 clubs you already have in your RH and pick up with your LH. One last thing: if you're in a rush, a flat is much easier to catch than a scud. It gets more complicated as you have very little time to pick up. But there still are at least 3 ways to do it. Keep the gap, then when you�re ready, kneel down and pick up while you're doing your LH self (probably the most difficult way). Hold through the gap, and when you have the gap, use the 2 beats you have to pick up. Throw an early double from your LH and use the resulting hold and the gap to pick up. If you know how to kick a club from your foot to your hand, this is the most elegant way to recover from a drop. You just have to wait for the best moment to send yourself or your partner the club you've put on your foot. The diagrams below should help you find the timing on a 4-count (but it works with any rhythms). Note: You don't have to keep the gap. Oh, wait. It seems there is a self in PPS. So the 2-count methods should work if your brain can sustain the rhythm. Also, kickups and early doubles might be a way to recover from a drop in 1-count. You give the club a little kick to make it land at your partner's feet. There, it's not your problem anymore :-). Here you are. Your partner screwed up once again and you have to manage a wrong end catch. It is too late anyway, so try to catch the club instead of stopping and yelling at him (or her). As usual, you can work on this with both hands. Try with one club--take it by the wrong side in the right hand and try to throw it to the left hand by giving it half a spin (better) or one and a half spins. The half spin may be harder at the beginning but it is easier to do with experience in some more complicated passing patterns and it is less obvious ( for the audience). Then try while juggling alone by intentionally throwing such "bad" throws, which will arrive upside down, and catch them. Finally, try while doing a passing pattern. Depending on your partner's skill level, you may not have to bribe him or her into throwing wrong. Beware of the rhythm: with certain rhythms ( ultimate, 3-count....) you have to throw back the club you've just caught, so look at the text below (throw the club back). I'll just give a quick idea. Whatever rhythm you're using, there is always a way (throw a double, triple...) to throw back the club you have on the wrong side to your partner (he is often responsible for that, so that's quite fair). Since you are a nice person, though, you could try to add or remove half a spin from your pass (but with normal height). With some practice, it is possible to reverse the club in the hand which has caught it before even throwing it back (with a self or a pass). It has to be done during the "dwell hold". Do not throw it again to make it do half a spin, but rather try to keep the contact with the club. There are 2 versions of this trick depending on the direction in which the club spins. A few tips on how you should hold your clubs when you start a passing pattern (works of course for solo juggling as well). Should it be avoided? Some people use it, and it may be an easier one for beginners. It won't allow for multiplexes, but is quite convenient for starting with a reverse spin pass. The one you should use? The bottom club is the one that you're going to throw first. Do not hold it too tight if you don't want to be smashed in the head. The best grip for multiplexes. Same as with the circus grip, but may be easier for throwing a triple. Also useful for multiplexes to different heights. This page is the next logical step from the previous page: beginners passing with 5 clubs , it is preferable to have read this first, but in the end, you're the one that is viewing it. What we would like to do, now that 5 club passing doesn't present any problems, is to add the 6th club, using the same pattern as with 5. You now have to agree upon a rhythm ( 5-count or 6-count). Take 3 clubs each (2 in the right hand, one in the left), and throw them. What changes when going from 5 to 6 is that you will always be juggling, and you have to catch a club immediately after throwing one. So of course you will start at the same time, which brings us to our first problem: how to start ? The fast start consists of throwing a pass to start. It's by far the most commonly used. Look at the page How to hold your clubs if you would like the details, as it's the hand that is holding 2 clubs that throws first. The slow start consists of throwing some selfs before the first pass. It is possibly easier for 2 beginners that are learning at the same time. In each case you will both have to start at the same time. To synchronize, start by raising your right hand (and the 2 clubs that are in it) above your right shoulder, look at your partner, then move your hands down at the same time to the side of your right leg, move your hand up and execute the pass. It sometimes helps to say "Up, Down, Pass" while executing this maneuver. The diagrams below should give you the idea, you can also look at some of the videos . Which Rhythm to choose ? If you have decided to try the ambidexterous rhythms with 5 clubs, you will be using either the 5 or 3-count rhythm. The 5-count rhythm is by far the easiest to start with as there are more selfs to stabilize the juggling after a pass. 5-count: a pass from the right hand is followed by 4 selfs, then we start again with a pass from the left hand. 3-count: A pass from the right hand is followed by 2 selfs, then we start again with a pass from the left hand. We always throw back the club that we have just received. If you have started with rhythms that pass solely from the right hand (or left hand), You will need to try a 6-count (the easiest as it is slow) or the 4-count. 6-count: A pass from the right hand is followed by 5 selfs, then it starts over again. 4-count: A pass from the right hand is followed by 3 selfs, then it starts over again.